Sri Aurobindo (15 August 1872 – 5 December 1950) – Indian nationalist, political leader, spiritual leader, author and poet. Major works include the epic Savitri. Sri Aurobindo falls into the exclusive category of Poet-Seers who have achieved the highest realisations and have endeavoured to share that experience with the rest of humankind. The teachings and very utterances that spiritual masters of this calibre offer to the world come from the most sublime realms of consciousness that human beings can attain to. Their poetry transcends the page to become mantra, an invocation to the transcendental consciousness. Sri Aurobindo, Indian nationalist, poet, philosopher and Spiritual Guru was born in Calcutta on 15th August 1872. Sri Aurobindo spent his formative years in England studying at St Paul’s and Trinity College where he excelled in the study of Literature and the Classics. In 1892 he returned to India where he became heavily involved in the Indian independence movement, he was a natural leader and one of the most radical nationalist politicians. Because of his radicalism, in 1908 Sri Aurobindo was arrested on suspicion of being involved in a bomb plot and was remanded in Alipore jail. It was here in jail that Sri Aurobindo had significant spiritual experiences, he became aware of a divine inner guidance and also realised the omnipresence of God even in a darkened prison cell. Due to the commitment of Sri Aurobindo’s lawyer C.R.Das, Sri Aurobindo was released without charge. However this experience had changed Sri Aurobindo’s outlook. Henceforth he retired from politics and focused his energies on spirituality. 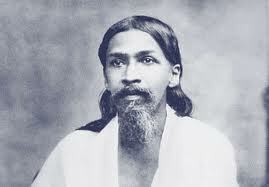 Sri Aurobindo travelled to Pondicherry, South India where he could practise yoga undisturbed. In 1914 he was later joined by a French women, Mira Richards who would later became known as the Mother of the Sri Aurobindo Ashram. Together they founded the Sri Aurobindo ashram, which began to attract disciples attracted to their dynamic reinterpretation of yoga. As well as being a spiritual Guru to many disciples Sri Aurobindo was a noted poet, philosopher and writer. His main works were The Life Divine, The Synthesis of Yoga, Essays on the Gita and Savitri. Savitri was an epic work of poetry that he worked on for over 20 years. Sri Aurobindo did not negate the world like Indian yogis of the past. Instead Sri Aurobindo affirmed that all life is Yoga; through a conscious aspiration it is possible for man to evolve into a higher consciousness – a consciousness of truth and inner harmony. Sri Aurobindo called this new consciousness the Supramental. For over 40 years, Sri Aurobindo worked tirelessly for his vision of a divine life on earth. Through his writings and poetry he left a legacy which reflected his hopes of a golden future for humanity. Sri Aurobindo entered mahasamadhi on Dec 5th, 1950.